Have you ever wondered what is happening beneath the ice on a frozen lake? How do fish and other organisms survive for so long beneath the frozen surface? Let's back up just a bit to talk about what happens before the lake freezes. During the summer, most lakes are thermally stratified. Warm lower density water sits on top of colder higher density water. As summer transitions to fall, the upper layers cool, breaking down that density difference. Eventually, the surface of the lake cools to 4 degrees Celsius (39.2 degrees Fahrenheit), the temperature at which water is most dense. This causes the water at the surface to settle to the bottom, pushing the now relatively warmer water at the bottom back to the surface. This process continues until the surface water cools below 4-degrees Celsius, at which point it becomes less dense, and eventually freezes. Remember, water is most dense at 4 degrees Celsius. It becomes less dense above and below this temperature. If water were most dense as a solid, lakes would freeze from the bottom up, eventually freezing solid. In that case, little or nothing would survive in the lake. Most lakes and ponds don't completely freeze because the ice (and eventually snow) on the surface acts to insulate the water below. Our winters aren't long or cold enough to completely freeze most local water bodies. This process of lakes turning over is crtically important to the life in the lake. 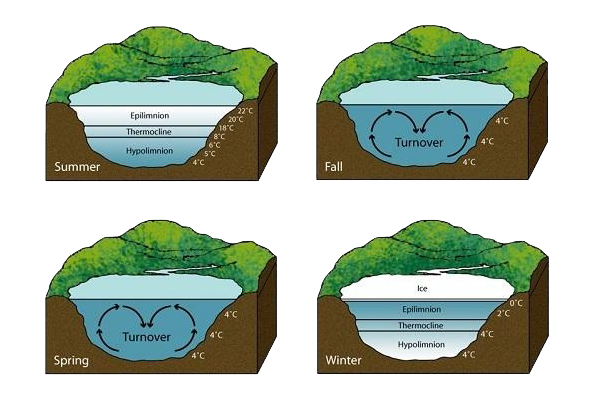 It is these turnover periods that infuse and distribute oxygen throughout the entire water column. Fish have several adaptions to survive a winter below the ice. First, they are cold blooded meaning their body temperature matches their environment. Colder temperatures mean a reduction in their metabolism. This slows numerous metabolic processes, such as respiration, digestion, and activity level. Fish are often classified as coldwater, cool water, and warm water species. The warm water species will seek out the warmest water they can, which is often found at the bottom of the lake or pond. They will also stay away from areas with a strong current to save energy. They hunker down in these areas and enter a state of torpor, reducing their respiration and using as little energy as possible. The coldwater fish species, such as trout and salmon, will stay more active throughout the water column and preying on other organisms. When ice forms across the surface of a lake, it seals off the water from atmospheric oxygen exchange and blocks out much of the light that is necessary for aquatic plants and phytoplankton to produce oxygen within the lake. Throughout the winter oxygen levels in the lake slowly decline. This presents a serious challenge to fish, because if the lake stays frozen for too long, oxygen levels can become low enough to kill them. Fish are the obvious organism to think about in a lake or pond, but what about all the other plants and animals that call the lake home? Phytoplankton, small single-celled photosynthetic organisms, produce thick-walled resistant cells that settle to the bottom of the lake where they overwinter. Zooplankton, the small, nearly microscopic animals that feed on phytoplankton, use a similar strategy. They produce a special resting stage that allows them to over winter in the relatively warm lake sediments. In the spring when the lake turns over again, and light returns, these resting stages become active. Many aquatic plants die back, but their root systems remain intact and store energy to produce new vegetation in the spring. Some phytoplankton remain productive throughout the winter by utilizing the little bit of light that makes it through the ice and snow. Many amphibians will enter a state of hibernation and seek protected areas, often burrowing down into the sediment along the lake bottom. The combination of the unique properties of water and the diverse adaptions to cold allow almost all of the plants and animals that live in our lakes to survive the winter. Next time you are out on the ice, pause for a moment to think about what is happening beneath your feet. 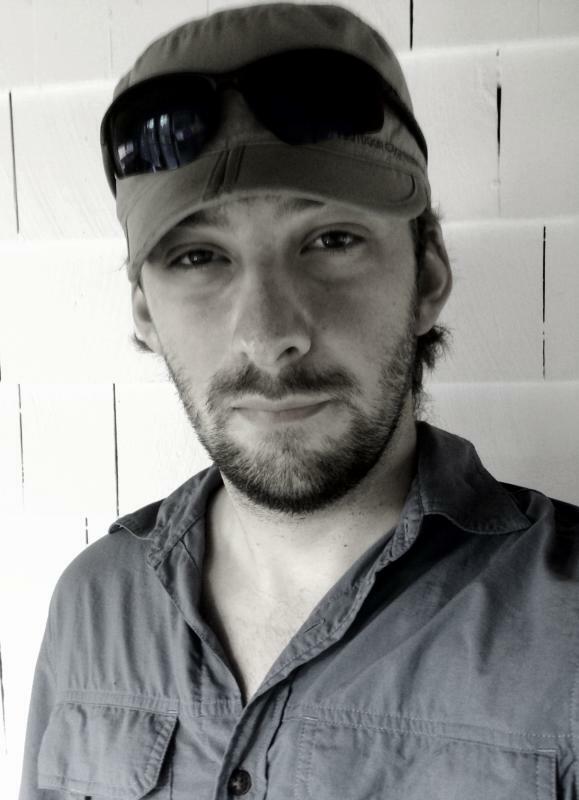 Brendan Wiltse is the Science & Stewardship Director at the Ausable River Association and holds a Ph.D. in Limnology from Queen's University. When Brendan isn't working on watershed issues for AsRA you will most likely find him exploring wild places with his camera and his dog.